Library Technologies staff have been busy adding more technology and equipment to improve your time in the Library. 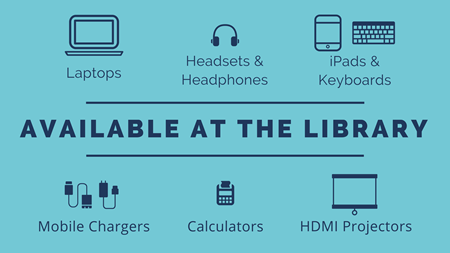 Library patrons may now borrow headsets with microphones for use in the Library building. The two loaner headsets work well for videoconferencing in a tech-enabled study room or on a laptop. You can also borrow regular headphones (without microphones). Headsets and headphones check out for three hours from the Library Circulation Desk on the first floor. We also loan mobile chargers that work with most Apple and Android devices. There is now a quick print computer on the Library’s second floor, near the book scanner and printers. At the quick print computer, you can sign-in for a brief period (15 minutes max) to print and go. This quick print station is at a lower height than the quick print stations in the Learning Ground on the first floor, so it is more accessible for people in wheelchairs. We are updating about half of the computers on the second floor with new desktops and monitors. We’ve installed additional 3-prong and USB power outlets on the tables and carrels along the windows of the third, fourth, and fifth floors. We now have two height-adjustable tables on the fourth and fifth floors, so you can read, write, or use your laptop while standing. The group viewing room will be converted to a practice presentation room, bringing the total to three practice presentation rooms. Projectable whiteboards will be installed in rooms 20 and 304, in place of the existing pull-down screens for the projectors. The kiosk computers — the computers available for catalog searches that don’t require you to sign in — are being replaced. The new computers will run much faster. The Sandbox touch-screen computers will be replaced with new Dell touch-screens. The new computers are much lighter and quicker than the existing ones. Many thanks to the staff who have been working hard to keep our technology updated!